ConductorsConductors are materials that carry electric current really well. are materials that carry electric current really well. Metals like copper are good conductors - that's why they're used to carry the electricity in wires and electricity flexesElectric wire covered in an insulating material like plastic..
Electricity always tries to find a path for itself to reach the ground - and it will travel through any conductors it can find to get there - taking whatever shortcuts it can. Water is a really good conductor. And, because your body is mostly water, electricity can easily travel through you to get to the ground. You could be seriously hurt or even killed. And remember, even if you are climbing a tree or a fence, you are still connected to the ground through the things your are standing on and can still be electrocuted. InsulatorsA material that reduces or stops the flow of electric current. don't carry electric current very well. Some types of rubber, glass and plastic are really good insulators. Household wires and electricity flexes are covered in plastic so you cannot touch the metal core which carries the electricity - but the overhead lines carried by pylons and in substations are not insulated at all - so keep well away from them. 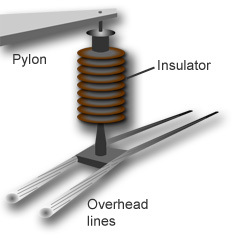 Pylons have ceramic or glass insulators to support the overhead lines so the pylon itself does not become 'live'. Even though some types of rubber are insulators, wearing rubber gloves or rubber-soled shoes or boots may not protect you from electric shock. Some good insulators are plastic, glass, ceramics and rubber.